To analyze functional outcomes and complication rates of artificial urinary sphincter (AUS) implantation in patients who had undergone buccal mucosa graft urethroplasty (BMGU) beforehand. This prospectively maintained single-center database comprises data from 236 patients from 2009 to 2015 who underwent AUS implantation. A total of 17 patients after BMGU were available for analysis. Primary endpoints consisted of continence and complication rates. Continence was defined as no use of safety pads, social continence as < 2 pads per day. Stricture recurrence was defined as a decrease in uroflowmetry, a maximum flow rate < 10 ml/s or residual urine volume (> 100 ml). Kaplan–Meier analysis determined explantation-free survival. Median follow-up was 24 months (interquartile range [IQR] 6–31 months). 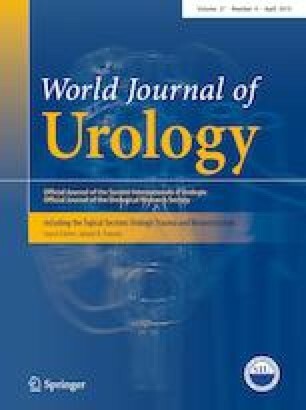 Indication for AUS implantation was severe urinary incontinence with a history of radical prostatectomy (RRP) in 8 (47.1%), trauma in 1 (5.9%) and TUR-P in 8 (47.1%) patients. Pelvic irradiation was reported in 13 (76.5%) cases. The median length of buccal mucosa graft for urethroplasty was 4 cm (3–5 cm). A double cuff was implanted in 14 patients (82.4%), 3 patients received a single cuff. Complete and social continence was achieved in 76.5% and 100% of the patients, respectively. There was no significant difference in complications and explantation-free survival (log-rank, p = 0.191) between patients who had undergone BMGU before AUS compared to patients with no history of BMGU. According to the prospective follow-up data in a homogenous cohort, AUS implantation seems to be a viable, safe and effective therapeutic strategy for incontinence treatment despite previous BMGU. Valentin Maurer and Phillip Marks contributed equally to this work. VM and PM: Data Collection and Analysis, Project Development, Manuscript Writing. RD: Data Collection, Manuscript Editing. CR and CPM: Manuscript Editing. SR and MR: Manuscript Editing. TAL: Data Collection and Analysis, Project Development, Manuscript Editing. Margit Fisch and Roland Dahlem has served as consultant for Boston Scientific. All other authors declare they have no conflict of interest. All procedures performed in our studies involving human participants were in accordance with the ethical standards of the institutional and national research committee and with the 1964 Helsinki declaration and its later amendments or comparable ethical standards.